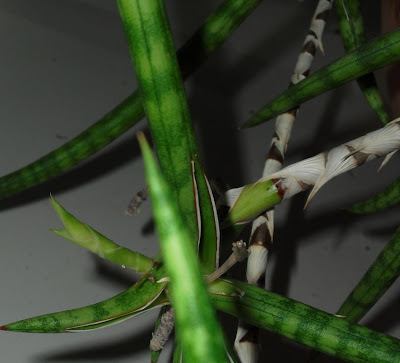 New growth for Sansevieria trifasciata 'Bantel's Sensation.' Note the small leaf on the left, and the brand new offshoot just coming up on the bottom far right, near the pot rim. Sansevieria trifasciata 'Bantel's Sensation,' whole plant. 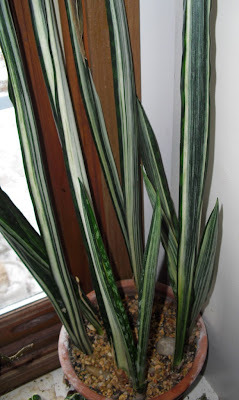 'Bantel's Sensation' is a somewhat temperamental plant for me, compared to my other Sansevieria trifasciata varieties. It tends to lose a leaf or two every season, though it always follows through with new growth. Tiny Sinningia speciosa (Florist's Gloxinia) leaves sprouting from the tuber, which I keep partially above the soil level. 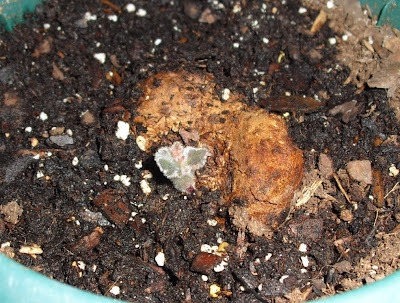 I've had this particular tuber for four or five growing seasons now. but is flowering as well. 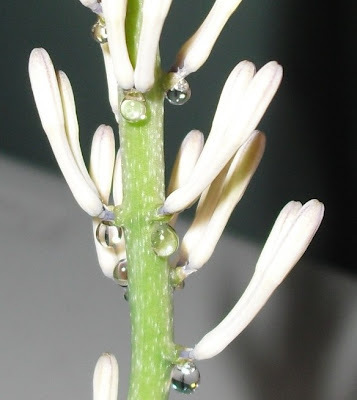 Close-up showing the sticky nectar droplets clinging to the base of the yet unopened buds. 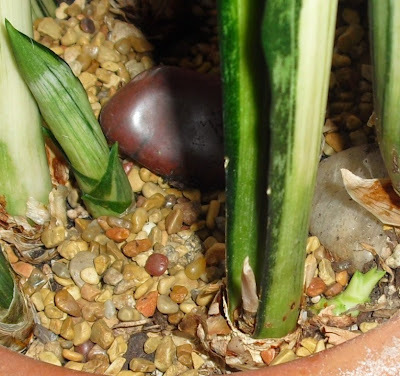 It was suggested that my Noid Sans might be Sansevieria ballyi or Sansevieria gracilis in the comments to this post. (Thanks, Nature Assassin!) I had considered S. gracilis before, but now I am leaning toward S. ballyi. But I'm not quite certain enough to put a label on it yet. WOW! That flower is awesome! How large and unexpected from a diminutive Sans.